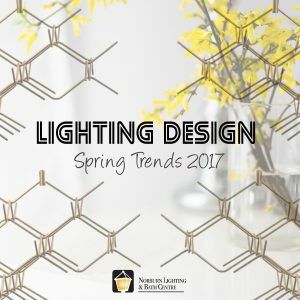 Posted April 24, 2017 by Norburn Lighting and Bath Centre & filed under Trends . There are some new and exciting explorations of geometric shapes, both minimal and complex, that are becoming signature design elements in many contemporary lighting fixtures. Check out the fixtures below for some great examples of this hot trend for 2017. The Planar pendant is influenced by Frank Lloyd Wright’s visionary Fallingwater home from the 1930’s. 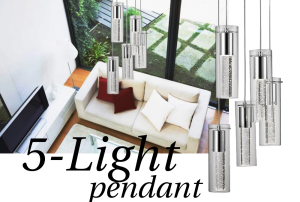 The LED pendant delivers clean, modern, gravity-defying lines that are sure to enhance high-end dining rooms and living rooms. The Planar is also handcrafted using steel at a Vermont forge. A delicate three-dimensional weave of steel shows off design inspiration and whimsy. You have the option to choose from two different finishes – one for the light fixture and one for the sculptural element. The Calx pendant has been an absolute hit in our showroom. The combination of the warm walnut wood, brushed brass and geometric shape are sure to make this pendant a focal point in any space! A series of geometric cubes set at various angles with a black or silver finish. This pendant provides a great amount of light, has strong visual interest and is easily adaptable to LED technology. There is unexpected elegance to this fixture that you would not find in a basic geometric fixture. Stop by our showroom for more geometric fixture options at various price points. Talk with our Lighting Specialists to help you find the perfect light for your space. We are open Monday to Friday 8.00am – 6.00pm and Saturday 9.00am – 5.00pm. Posted January 5, 2017 by Norburn Lighting and Bath Centre & filed under Trends . 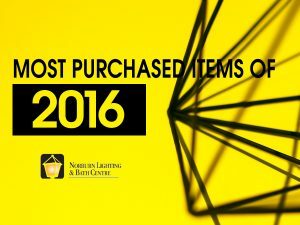 As we begin a new year, we’re looking back at some of the trendiest, and most purchased items of 2016. 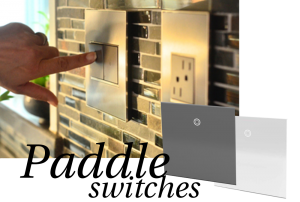 Legrand offers sleek and trendy wall plates, dimmers, outlets, and also paddle switches that make it easy to turn lights on and off. The commonly purchased paddle switches were in a Magnesium and White finish. The LEDme collection from WAC Lighting are designed with such minimalism that allows it to be a versatile component. This lighting system helps optimize visibility in staircases, pathways, and elevates the look of the space. 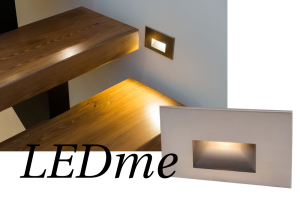 The LEDme Step and Wall Light was most purchased in a brushed nickel finish. This chrome pendant with round etched glass was a hit among our customers. As well as this 1-light pendant from the Politan series, that has optic crystals encased within a cube glass shade. Another popular fixture that was purchased in 2016 was this 5 light LED pendant from Kuzco Lighting. 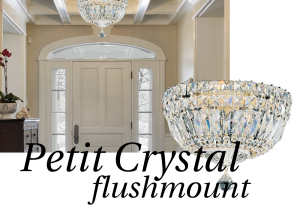 This pendant has a layer of encased crystal bubbles that are protected by an exterior clear glass shade. A traditional chandelier that was well loved was this chandelier by Schonbek that gives off an 18th century feel, and is fully made with crystals. 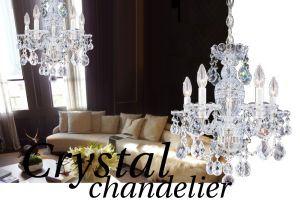 From it’s hand-formed crystal arms, crystal column pieces, holders, and suspended crystal jewels, this chandelier exudes extravagance and royalty. 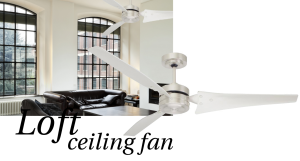 Keeping it cool with the Loft Ceiling fan by Emerson Fans. The simple aesthetic and seamless lines gives this fan a modern look and was well received by our customers. The fan has a four speed wall control that is also remote control adaptable. In addition, the Loft ceiling fan is energy star rated, saving energy and money. 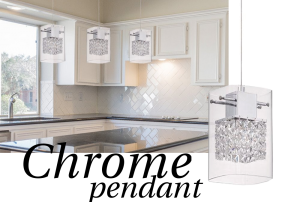 The Benalua flush-mount by Eglo Lighting was a flush-mount that won the crowd. 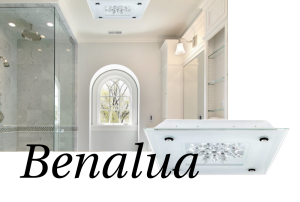 The flush-mount is made with white glass with clear glass edges. The crystals are arranged in a floral pattern for added visual appeal. This vanity lighting from Kuzco Lighting is in a chrome finish and designed with diamond cut clear crystals. The vanity uses LED technology for the lighting source, making it energy efficient and an exquisite statement piece. 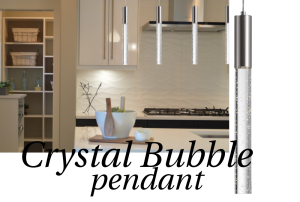 Another crowd-pleaser from Kuzco Lighting was this 1-light LED pendant, designed with encased crystal bubbles in a brushed nickel finish. 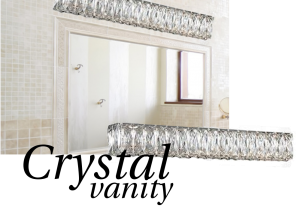 The sleek tubular design gives it a contemporary look while the crystal bubbles provide sparkle. This flush-mount by Schonbek was inspired by Classic Empire Designs, using angular crystals to form it’s architectural shape. A glamorous piece that completely transforms a room into opulence. 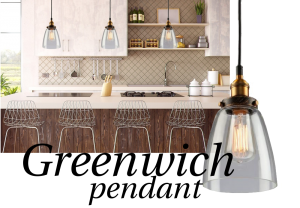 This 1-light pendant from Artcraft offered a rustic charm to our customers, with it’s warm copper and brown tones, and the use of clear glass to expose vintage Edison bulbs. 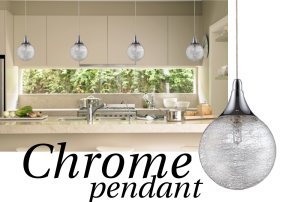 We can’t forget about the Ramos pendant by Eurofase. 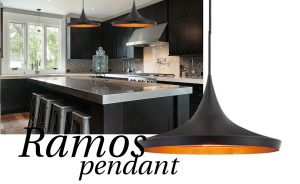 This pendant has a smooth design, and contrasts matte black with antique gold to add visual interest. Let us know what your favourite fixture was. We’re excited to introduce some new fixtures this year, so keep an eye out!